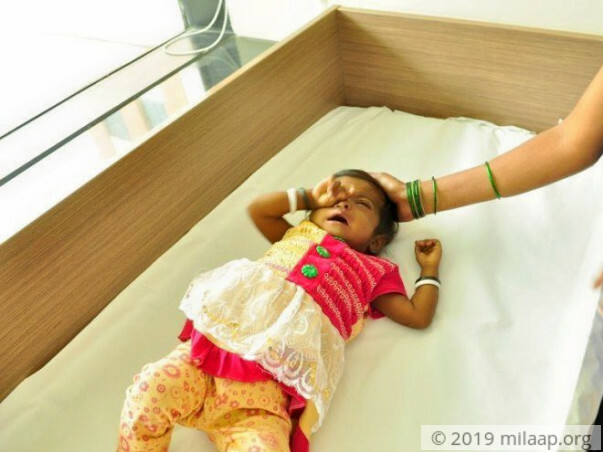 Even as her parents worry about her survival every single day, Sagar and Soni’s 15-month-old baby’s liver has almost completely deteriorated. She doesn’t have much time left and only a liver transplant can save her life. As her condition worsens every day, her parents are facing a serious challenge because they have nothing left to save her. Their baby vomited everything she ate and developed a yellow tinge in her eyes. Sagar and Soni were completely distraught when the doctors told them that their 15-month-old baby had end-stage liver disease due to Biliary Artesia - a common condition where the bile duct is blocked and corrosive bile collects in the liver. Their baby’s liver is almost completely damaged due to a birth defect and she doesn’t have long to survive. She also underwent a corrective surgery, but her parents received yet another massive blow as it was unsuccessful. “We give her medicines two-three times a day, otherwise she’s constantly crying and suffering. It’s so hard to see her like this. She doesn’t have long to live and just the thought of that is giving us tremors. Soni, my wife, often breaks down by just looking at her.” – Sagar, her father. As her liver has deteriorated, the baby has constant jaundice. Her skin is abnormally yellow, just like her eyes. She’s also unable to urinate properly and is constantly itching. Her painful illness makes her every smile more precious. At the age of just 15 months, her liver is deteriorating every single day and is functioning way below normal which is dangerous and life-threatening. She cannot survive without a liver transplant and is running out of time. Initially, Sagar and Soni struggled to get all the tests done on their baby. They took her from hospital to hospital and instead of getting options they were always asked to prepare for the worst. She had very less time, more so after the failed surgery. “The doctors say that a liver transplant is the only option but it’s so expensive. I’ve been to several hospitals, and many have told me to go to Delhi or Chennai to get her treated but how will I go without any money? After every visit to the hospital, my wife and I were very disappointed because everyone's quotes are so expensive. There is no way I will get enough money in time. My daughter is very critical and I can’t believe that she might lose her life because we are poor.” – Sagar, sounding very upset. As their baby’s condition deteriorates every day, Sagar and Soni are running out of time to save their daughter. She is getting yellower every day and simply cannot survive without an immediate liver transplant. Her mother, Soni is willing to donate her liver, but as things are now, the parents are struggling to even get her tests done. Sagar works as a car driver and earns barely any money to save anything. Soni is a housewife and they have another 4-year-old daughter, Saakshi, to take care of too. Sagar and Soni’s 15-month-old baby’s only hope of survival is to get a liver transplant. As her condition worsens every day, her parents are running out of time to arrange he funds needed to save their baby. Now, they need your support to make this possible. Your support will save Sagar and Soni’s 15-month-old baby. With inexplicable grief, we're having to informing you all that Soni passed away on 21th May'18). Even after giving her the best treatment possible, to drain out water from her liver, so a liver transplant could be performed, we couldn't save her. She developed a serious infection which complicated the process of draining out the water. She also started vomiting blood and eventually, we lost her. Thank you everyone for your constant support. We will forever be indebted to you. Thank you so much for your tremendous love and support. None of this could've been possible without you. Soni is currently hospitalized. She was taken to the hospital on Monday. Her stomach has water which needs to be drained out. She is in the ICU now. She needs to undergo a liver transplant at the earliest. 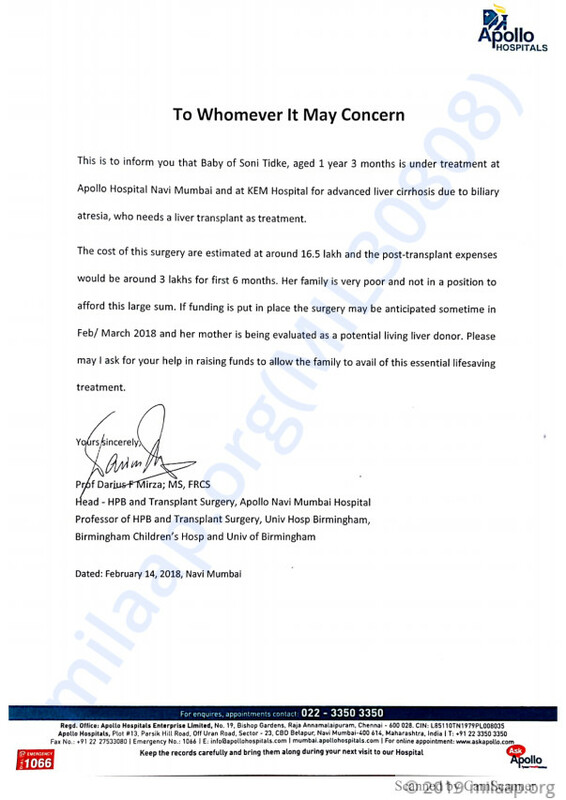 It gives me immense pleasure in informing you all that the doctors have identified her mother as a potential donor. We are all hopeful and praying for her well being. Please keep praying for her so we can help her live a happy life ahead. Thank you all once again!